FingerTec Ingress and TCMSv3 can export attendance data into several formats including .xls, .xlsx, .txt and .csv. Export Details provides you with clocking details such as the In, Out, Break, Resume, OT and Done times of each user per day. 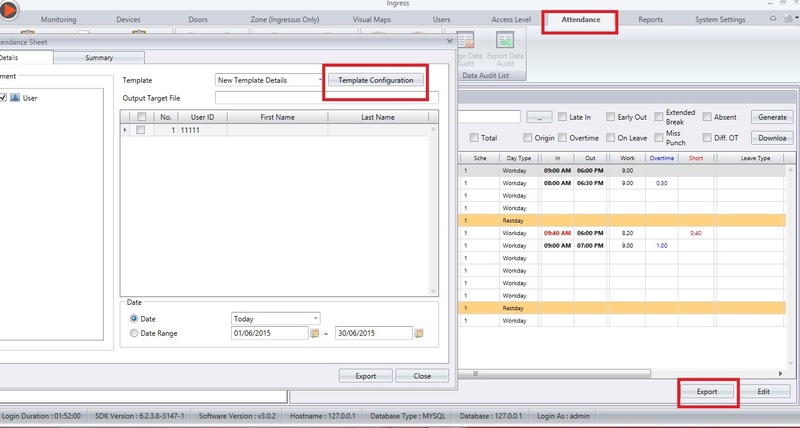 Export Summary simplifies clocking data such as Total Workday, Total Present, Total Short time, etc for a specific date range. This function lets users export their attendance data to other software or payroll system for further analysis and augmentation with just a few clicks. You can also retrieve your data from the software anytime to prevent you being stuck in one system, providing you options to shift to a better system if need be. Click the Export button > configure the template for the export > Click on the Template Configuration button. Right click at Template Details, and click Add Template Details. Rename the template according to your preferences. Click the Edit button, and specify all the related fields. 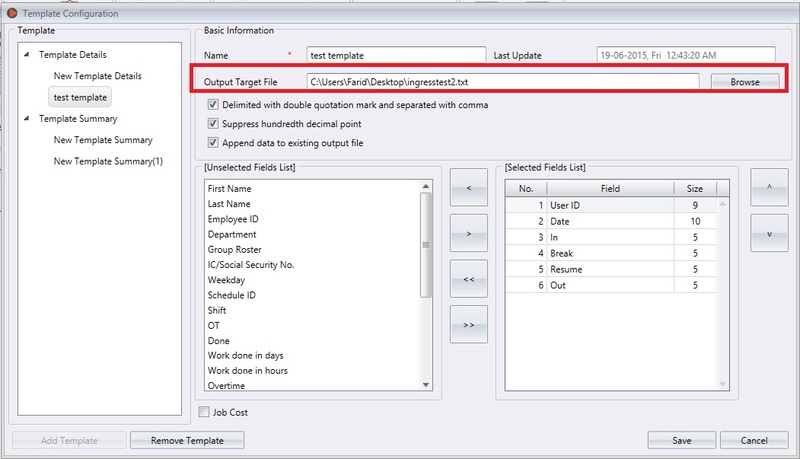 The most important part here is for you to specify the Output Target file. You can choose the format of file to be saved, whether in .txt, .xls, .xlsx, or .csv format. If you choose .txt format, the 3 parameters below the Output Target File will be enabled, while other formats do not support these features. Please select the data on the left-side table, and use the left or right arrow to select the fields you want to export. The up and down arrow on the right side is for you to sort the columns of your output file. If you are using Flexi schedule with job-costing function, you need to check the “Job Cost” check-box at the bottom of the window, so that the output file will show the job-costing data correctly. After you are done with the template configuration, click Save and Close. You will be reverted back to the Export page. Here, you need to first select the Template, and make sure the Output Target File name appears on screen. Once done, please select the users which you want to export the data to, and select the date range. Click on the Export button, and your file will be ready. I need to get day type and week day both in report. when clicking on Export, the progress bar to the left stops at 2% or more and no files being created. I've tried over and over and changed the target folder and formats and it's still the same, please advise. Then, make sure you configure the template correctly, because if no template, the system will not able to export the data. Try to update your Ingress software and try it again. Make sure you backup your database before you update your software. To update your software, uninstall the current Ingress software from control panel. After that, install using the latest one that you download from the link given. I'm using the latest version of TCMS V3! !